Beetroot relish – savory, sweet and spiced with with cloves and star anise – nuzzles its way onto our supper plates every winter. A near-perfect side to pan-fried pork chops seasoned with sage or to a classic roast beef, beetroot relish provides an intensity of flavor coupled with nourishing micronutrients including vitamins, minerals and antioxidants. This version of beetroot relish incorporates another wintertime staple: fresh apples which contribute a sweetness without the inclusion of the nutritional void that is sugar. Moreover, my beetroot relish is a probiotic food, rich in beneficial bacteria due to a natural, traditional fermentation process that anyone can apply in his or her own family kitchen. Beets and apples are both dense in antioxidants, ensuring that the combination of these two primary ingredients convey significant nutritional benefits to the beetroot relish. Indeed, apples are rich in myriad phenolic compounds: quercetin, catechin, procyanidin and phlorozin among others. Perhaps these compounds contribute to the near-global perception of the humble apple as a food critical to health maintenace. Beets also contain powerful nutrients. Betacyanin, which accounts for beets pronounced color, may show promise in the treatment of cancer according to some researchers. This recipe yields approximately twenty-four 2-ounce portions. Don’t let the high yield of the recipe deter you; this apple and beetroot relish is rich in beneficial, lactic-acid-producing bacteria which naturally preserve the dish, ensuring that it will keep for approximately six weeks or longer when refrigerated. Shred apples and beets by hand, or in a food processor. Toss the shredded apples and beets together until well-combined and mixed together. Add the cloves cloves to the apples and beetroot, and continue to toss until the spices are evenly distributed among the shredded fruit and vegetables. In a mason jar or, preferably, a vegetable fermenter,layer the apple and beetroot. Periodically sprinkle unrefined sea salt or vegetable starter culture over the layers of apple and beetroot and mash with a wooden spoon or mallet to encourage the fruit and vegetables to release their juices, creating a luscious brine to encourage the proliferation of beneficial bacteria. Ferment in a mason jar or vegetable fermenter for a minimum of three to four days, or longer, depending on the level of warmth in your kitchen. After your apple and beetroot relish has sufficiently cultured, remove it from the vegetable fermenter. 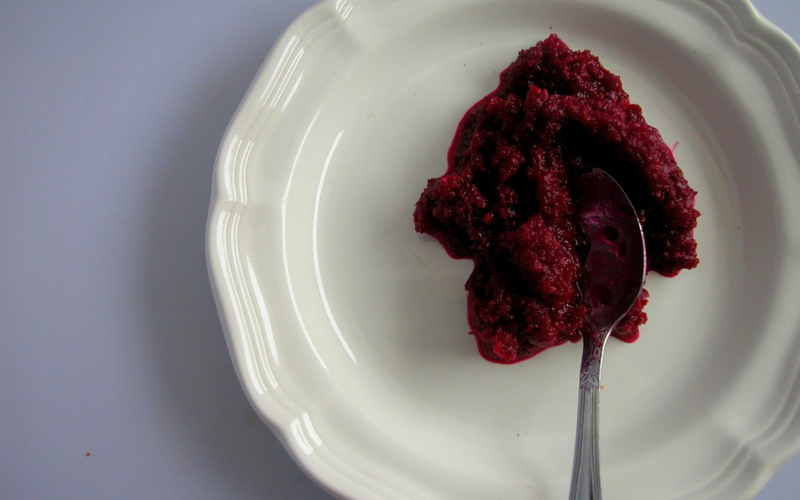 Place the apple and beetroot relish into a blender or food processor and process until smooth. I have made sauerkraut before… but not beets.. great idea! Thank you for this recipe! I like relish and chutney as a meat accompaniment, and this relish has one of the top super foods in it –beetroot. I’ll let you know how it turns out. Oh! Oh! I love fermented beets and usually season them with caraway and dill, but this combination sounds divine! Can’t wait to try it…that’s one of the problems with ferments, tho’, isn’t it? You gotta wait! 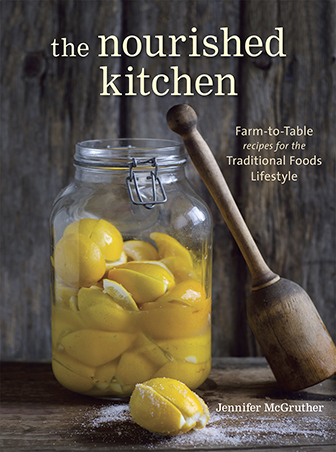 My wife and I are hours old in this, your recipe for beets/dill/caraway sounds good. What is your recipe and process? Wow, this sounds just lovely, and the color is beautiful! This looks just divine! I just made simple sour beets myself this week, but this relish looks like yet another way to enjoy the bounty of beets this season. Thanks! My favorite vegetables for fermenting are beets and carrots but I have never tried adding apples to the beets. This sounds just delicious. I have never used star anise – I have got to get more adventurous. I’ve always ruled it out because I’m not a big fan of licorice, but I am learning that the combinations of herbs and vegetables can be so exciting and small variations in ratio can make a huge difference in flavor. It’s easy to get stuck in a rut, making ferments the same way every time so I am excited to get new ideas and recipes. I am looking forward to making my own beet kvass as soon as I can find a corn-free milk source. Have you ever tried it? Got any tips? Beet and apple relish sounds interesting and I’d like to try it, but no one in my family likes anise. Not a big fan of cloves either. Can you suggest alternative spices? By the way, just made your tomato salsa tonight for the second time. It was a big hit with the kids. Thanks for the recipe and your wonderful blog! This sounds great but is there something I can use instead of the star anise? I can’t find that (or any anise AFAIK) in my little backwater town. Thanks! Mine is fermenting now. I’ve let it go about a week so far since it’s cool. This is my first batch of fermented food, so I’m excited to see what happens! I’ve tried it a couple times and find it a little salty so far, so I think I’m going to let it get more sour. I changed quantities just a little, using 2 pounds of apples an 1 pound of beets. Two of my beets were chioggias, so between that and the apple/beet ratio my relish is more vivid pink. I also added a couple tablespoons grated fresh ginger. I bet your use of the chioggia beets was magnificent – it must be such a pretty relish – and I bet the ginger is just amazing in it. I think I’ll have to try your variation some time! Couldn’t you use whey instead of a vegetable starter culture? You could definitely use whey in place of vegetable starter or you could omit a starter altogether. I don’t personally care for whey ferments, so I never reference them at Nourished Kitchen – that doesn’t mean it won’t work for you, though. Can I ask why, Jenny, you don’t like the whey ferments? What is the quality that you don’t like about them? It’s all I’ve ever used, so don’t know if there might be something different, lol. I am looking forward to trying this this week. Just got to try and round up some organic beets, as I haven’t got any in my garden this year. I do love Kvass (only one in the family who does! ), and I look forward to trying this with our goat, lamb and roast beef this winter! Did you use whey? How much? I’m trying to find ways to use the copious amount of whey I am accumulating. and I love beets and apples. so glad you found me…I will be back! I just thought you might be interested at in an update. I ended up fermenting it about 10 days. After fermenting and blending it wasn’t nearly as pink, although it is still lighter in color than yours. I really like it, it’s very interesting. I have found that I like it mixed into a little yogurt, which makes a brilliant pink sauce (the yogurt also helps temper the intense flavor of the relish for those of us who are acclimating our taste buds to real fermented foods!). Thanks for sharing the recipe, I anticipate routinely keeping a jar of this in the ‘fridge! I wouldn’t use water kefir, I’d just go with a wild method but, of course, I prefer wild ferments. Is there a reason, other than your preference for wild ferments, that you say not to use water kefir? I’m new to this – but so far water kefir is what I use as an inoculate, so if there is a reason why not, I’m curious to know what it is. This is all very new to me, but I’m excited to give it a try. Concerning the vegetable starter culture, do you have to use one? If so, do you have a direct link – I could not find it on the “sources” page. Also, I can just use a mason jar if I don’t have access to any fermentation equipment? Are you using an adblocker in viewing the site by any chance? A mason jar will definitely work, but a vegetable fermentation master equipped with an airlock produces more reliable results. My beets and apples are still small – going to hold out on this one. Oh you should hold out until they’re larger. When you do make it, it’s phenomenal – especially when paired with sage-rubbed pork chops. WOW. Yes I will have a surplus of both beets and apples once they are ready. I can’t wait to try this out! How long will this keep once you blend it? Will it still be good for a good long time? I am curious. Would apple cider vinegar be a good kick off to cut back on the salt some and in place of the ferment starter? It crossed my mind since there are apples in the mix, and I always keep a big stash of ACV on hand for when I need vinegar for cooking. It tastes so much better then white vinegar. I just started this yesterday using apple cider vinegar and cut back on salt a bit. My brine is covering the shredded apples and the beets, but I really have no idea what I am looking for when it comes to safety and taste. Not so much concerned with taste as I am with safety. If you did use the ACV for this, can you let me know how is came out?? Hi! Is it ok if I use whey Instead of the starter culture? Thank you! Hi, I made this a few days ago. It was working great, but I just opened it this morning and there were black fuzzy bits on the surface. Is it still Ok to eat? it smells like a fermented food (kind of like a pickle), and feels fine, not mushy. What do you think? Hello ~ so it says starter if desired… Why? What does that mean? So far I’ve only done ferments that didn’t need starters ~ is there a reason to use a starter sometimes or is it always just a jumpstart kind of a thing? And for the starter, can’t it be the juice from another ferment technically? Any info on this subject would be much appreciated. I’ve scoured high and low and not found anything to help me. Thank you! and thanks for the blog and all of your info! It helps (GAPS diet) and it inspires… which helps even more! Sounds good. Who do you eat it with ?? How do I know when its ready? I have never really tried fermented foods before. I have had this relish on the bench for 4 days it is winter max temps early 20° max. Dont want to refridgerate too soon and miss out on benefitial probiotics. Want to try this one! BUT I didn’t see any answers to two earlier questions. I cannot find star anise here either, what can substitute or can it be left out? Also a substitute for cloves? Like the other poster, I am not a fan of clove either. Where do you get a vegetable starter? I made this about two weeks ago and I can’t really seem to see a difference. So far I just have wet, salty, flavoured beet root and apple. Any advice? It’s simply sitting in a mason jar on the kitchen counter, no mold, no apparent change in appearance, texture or flavour. 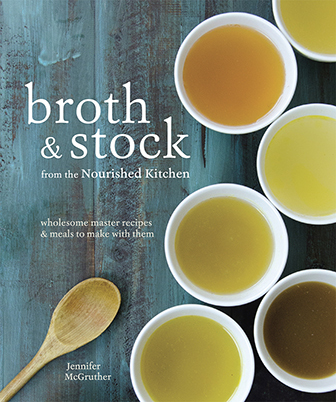 I’m just starting out with fermented foods and this is amazing and tastes delish. How long is it safe to keep in the fridge once it is ready – and I fermented in a Fido type jar, with the lid shut – is that right? – tatses alright, just wondering about the fermenting. Once ready, How long does it last in the fridge? Great blog, I’m new to fermenting foods, etc, but I’m very excited to start my journey and thanks for all the info, it helps a lot. A question about the apple and beetroot relish. When you put it in the mason jar (I don’t have a vegetable fermenter yet), do you close the jar with the lid and let it sit like that? No air needed for the fermentation as with sauerkraut? Just made a batch today and I’m looking forward to tasting the results…although I am NOT looking forward to picking out the cloves! I imagine that will be pretty difficult once everything takes on the same color. I was wondering if anyone has used ground cloves with good results? trying out the beet/apple , as a first timer to fermented foods. I used ground cloves, as I figuered I would never find cloves in all that ‘dark matter’. Does anyone else have that problem? Used Fido jars so far cannot see much in the way of liquid. It has only been 24 hours though. I too am VERY new to fermenting foods. I do not at all care for licorice and that’s what the anise smells like. For anyone who has made this, how strong is that taste in the finished product? Also, if I use the 1/4 c whey do I not use any salt at all? If I don’t have time to ferment as much as normal, if I ferment only a day with the vegetable starter culture, can I still use it as a slaw? I’m trying to plan a party for Saturday and the person has unique dietary restrictions. Thanks! This looks absolutely delicious. I love beetroot, so the fact that you turned it probiotic is fascinating! I definitely want to try this the next time I head to the farmer’s market. Thank you for sharing! I want to make this but your recipe leaves out the info about the star anise. How much? The whole star or ground? And process until smooth is confusing for a relish. I ferment a lot but I get insecure when using someone’s recipe. Please make it more clear.